The holidays often bring melancholy to those who have lost loved ones, or who yearn for the days when their children were small and the family was large and boisterous. They miss the noisy holiday dinners, with perhaps 20 friends and family members around the table. They mourn for those who have passed on, and wish that their children could be home again, rather than living in some other part of the country - or dining with their in-laws. If holiday dinners are now the same as dinner every other day - cooking for only one or two - it's easy to feel depressed. These are natural and normal feelings, but when they destroy enjoyment of the "now," they need to be addressed. The sufferer needs to move forward, accept change, and find enjoyment in today while still retaining and cherishing good memories of the past. Honeysuckle is the Bach Flower Essence that will help re-balance those energies and allow a person to live well in the present. It's also natural to have regrets from the past. Everyone has done or said something that he or she wishes could be erased. If those regrets have grown into genuine feelings of guilt, then Pine can be added to the Honeysuckle for a more complete Bach Flower Remedy. If you or a loved one is having trouble letting go of the past long enough to live in the present, visit FeelBach! to get your personal remedy. Shipping is fast, so in just a few days you'll be on your way to a happier holiday season. Would you like to know more about what each of the Bach Flower Essences can do to enrich your life? Visit our information site to read about each of the 38 Bach Flower Remedies. If you're the one cooking the feast, you naturally want everything to be perfect, and if you're insecure about your culinary skills, you may be worried to the point of feeling ill. For many, this insecurity causes them not to attempt such a thing - but sometimes you just can't get out of it, no matter how worried you are. If you're seeing family members you haven't seen since last year, and things haven't gone well for you financially in this past season of economic turmoil, you may be worried about what they'll think of you. You may be bracing yourself for cutting comments or criticisms couched in the guise of "suggestions" for ways to get out of a financial mess. Even if things are going fine, you may dread facing someone who always criticizes your haircut, your clothes, your children, your pets... and on and on. These feelings all stem from a lack of self-confidence, and there IS something you can do about it. Get over to FeelBach! and get a bottle of the Bach Flower Remedy Larch. Larch can help you regain your self confidence, so that you're not afraid of what people think or say. You can let them babble on, trying to make themselves feel important, and realize that it isn't your problem - it's only their own insecurities that make them so obnoxious. And, if it's the dinner you're worried about, you'll be able to get through it knowing that you DO know how to present a great meal - and if anything goes wrong, it's no big deal. But hurry up... if your feelings of inferiority have been with you for a long time, you need to start changing those energies now, so that you're ready for Thanksgiving and for the whole holiday season. Are you one who loves the holidays and looks forward to all the extra work, socializing, and activities? Or are you one who dreads the whole thing and wishes it could be over before it begins? If you're dreading all this, there could be many reasons why. The first, of course, is just that your days are already filled to the brim and now you want to add more. You actually WANT to do all the decorating, baking, shopping, wrapping, and entertaining. And you actually want to write nice letters in each card you send. Then you want to go to all the parties, caroling, parades, and other holiday events. It's all just too much, unless you have a way to put your other work on hold for a couple of months. Now might be the perfect time to set aside an hour for yourself and think about it. Think about how many hours are required for each of the things you want to do, and then put them in your schedule. Or think about which activities are your favorites - put them in the schedule and decide not to do the others. Think about which activities you do because YOU really want to do them, and which you do because you want to please or impress someone else. Maybe the solution is to spread some of your activities out over more time. You could start addressing those cards and writing those letters this week. You could send them for Thanksgiving rather than Christmas or Hanuka. Or, you could schedule them to do in the week after Christmas. In fact, if you send them at an unusual time, it's more likely that your recipients will have time to enjoy reading them. Meanwhile, if you begin getting stressed just thinking about all of it, take a lot of deep breaths and keep your bottle of Feel5ive handy. When you feel yourself becoming anxious, take a few drops and settle down. Holiday stress has too many causes to address in one post, so watch here for more clues on how to make the most of this season - or get over to FeelBach!and fill out the questionnaire. Get your personal remedy now and you'll be ready to actually enjoy the holidays this time! The people in "The Secret" will tell you - celebrating Thanksgiving every single day of your life is the best way to attract good things. So why not set aside this month of November to create a new habit? Even when things are tough, we all have something to be thankful for, so choose a time of day when you can be quiet for a few minutes and give thanks and appreciation. If your life is too full of people and noise and things you need to do, take an extra minute or two in the shower to just think about the good things in your life. If you can't think of anything else, think about that hot water and how good it feels. If you can find time, start a notebook and write about the things you're thankful for each day. Start noticing the little things, as well as the big ones. Give thanks for a sticky kiss from your child or grand-child. Give thanks because you happened to look out the window in time to see a Cardinal or a Blue Jay hop across the yard. Give thanks because you turned on the radio in time to catch an old favorite song. When you start to look for things to appreciate and feel thankful for, you'll find them all around you. If you're really down - over the economy, over an illness, over a legal or financial problem, or over a loved one's troubles, try using Get Hope Back from FeelBach! If you're unable to let go of old emotions that block your happiness,try a few drops of Joy throughout the day. Let this November be the month that you begin to experience the happiness you were born to enjoy. Start right now, with giving thanks that you can read this message, and that you can get over to FeelBach to get the remedies you need! It seems like nearly everyone who smokes wishes they didn't, but how to quit? There's a prescription drug called Chantix that many say is the cure. But, prescription drugs come with side-effects, and some of them are pretty awful. I read about one man who went into such a deep depression that nothing seemed to help. He went to emergency rooms and mental health clinics, but to no avail. His doctor finally put him on an anti-depressant medication, but it wasn't really helping either. This man, who had been happy to quit smoking at last, told his daughter that he didn't think he would ever be happy again. His doctor didn't want to believe that the prescription caused the depression, but the side-effects are listed for all to see. They include depression, thoughts of suicide, and bizarre behavior. That’s while you’re taking it – and withdrawal symptoms can be just as bad. The "bizarre behavior" seems to include violence. I've read reports of people becoming extremely violent, even with those they dearly love. This effect is intensified by alcohol, so if you take the drug, beware of drinking. So what is a better, safer way to quit? FeelBach! offers a Bach flower essences formula called Quit Smoking. While nicotine is physically addictive, behaviors can be emotionally addictive. As a result, strong ties to the past and an image of "who you are" can render prescription remedies useless. If you really want to quit, Quit Smoking will balance your system and help you overcome both the chemical and the emotional sides of addiction. The hours we spend sleeping are vital to our well being... this is when our bodies can turn their attention away from activity and work on repairing themselves. In kids, sleep is when hormones that help them grow are released and when tissues not only repair themselves, but grow. Without sufficient sleep time, they can suffer serious long term damage. Studies now show that kids between 5 and 12 years of age need 11 hours of sleep each night and teens need 8 1/2 to 9 hours. Parents are right to be concerned about kids not getting sufficient rest, but wrong when they think that as adults they don't need to pay attention to their own sleep patterns. The average adult needs about about 8 hours – and we should take it, no matter how many tasks and obligations demand our time. Our bodies also need time to repair, and without adequate rest, we aren't very efficient at taking care of all those obligations that keep us awake. But it isn't always demands on our time that rob us of sleep. Sometimes it's our minds and emotions that keep us awake long after we've turned out the lights. Because this is so common, Feel Bach! has created 4 different Sweet Dreams blends to help you break the "sleepless" pattern and begin getting the rest you need. Because they're Bach Flower Essences, they won't leave you drugged and groggy in the morning - and you need have no fear of side effects. Unlike pharmaceuticals, they won't cause you to get up and go driving while you're asleep! Sweet Dreams #1 is for people who can't let go of the day, but instead lay in bed thinking about unfinished work and what needs to be done tomorrow. This one can turn into a chronic habit that's difficult to break - I know, because I did this for years. In fact, during an especially busy period of my life, I actually stored things away to think about after I went to bed, because I just didn't have enough quiet time earlier in the day. Talk about a wrong approach! Sweet Dreams #2 is for those who can't relax enough to ignore the little noises of the night, or when you're worried about waking up on time in the morning. The very night when you should get plenty of rest to be sharp for a morning presentation turns into the night when you lay awake until an hour before the alarm rings. Sweet Dreams #3 helps calm the fears that keep you awake. If you lay there and worry about something that may happen, or re-live something that did happen, this is the blend for you. Sweet Dreams #4 is for folks who fall asleep easily, but then awaken far earlier than necessary. If you're not getting enough sleep because you simply aren't going to bed when you should, change your habits. Your health is at stake and it's worth more than that TV show or last chapter of a good book. If your lack of rest is because you agree to do too many things, begin saying "No" when it means you'll lose out on sleep. But if the problem is that you just "can't sleep," try one of the Sweet Dreams formulas. You'll feel better physically and mentally - and you'll probably accomplish more every day as well. Working at a computer all day, working in a dusty environment, or living with stress can all put plenty of undue stress on your eyes, but there are natural, healthy ways to relieve the strain and let you see clearly again. If you have the luxury of coming home to relax a few moments before getting on with evening chores, try a cucumber slice on each eye for soothing, immediate relief. Then, to remove the debris that may be causing irritation, wash your eyes with an ounce of distilled water containing one drop of pure lemon juice. To protect your eyes and prevent the strain, try adding colorful fruits and vegetables to your diet. The reds, oranges, and yellows provide Lutein & other carotenoids, and protect the eyes from sun and age damage. The Red and pink fruits and vegetables contain a range of carotenoids and vitamin C, and protect eyes from free radicals. Dark green vegetables provide potent antioxidants and prevent age-related damage of the eye. The dark blues and purples contain Anthocyanin, which protects the eyes from cancer. While you can buy supplements for eye health at your health food store, the vitamins and minerals in colorful fruits and vegetables will add to your whole body health - and they taste good. But what if all your vision problems come down to stress? You can either choose a bottle of Feel5ive for generalized stress, or you can dig deeper to find the cause and treat it with one or more of the 38 Bach Flower Remedies. Start with the guide on the FeelBach! website, then go to www.bachflower.org to learn more about the Bach Flower Essences you've chosen. "What if" is a terrible ailment, because it prevents the sufferer from enjoying life - and from allowing his or her children and other loved ones from enjoying life. I had an Aunt who suffered most of her life from "What if" and she really did suffer. 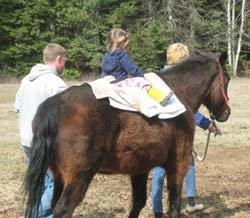 One event sticks out in my mind - we had a very old, very gentle horse, and one of her children wanted a ride on that horse. Her response was "What if it bucks her off?" Had we known about the Bach Flower Essence Red Chestnut at that time, my Aunt might have enjoyed life a lot more - and I'm sure her children would have too. Most people who suffer from a negative Red Chestnut state do so for short periods of time, but those like my Aunt suffer all their lives. The Red Chestnut state can occur in reaction to an event - such as the birth of a child. It can also be an occupational hazard. Counselors and nurses sometimes fall into this state. He or she may be suffering from a negative Cherry Plum state - which can be dangerous. In this state, people feel ready to explode because they keep so many feelings pent up inside. They keep themselves under tight control, not letting on to the outside world the turmoil that resides within. In adults, it can lead to violence when the "dam finally breaks." It also leads to depression, and an inability to stay focused and on track. In children, it can lead to bed wetting. These children exhibit extreme control when awake, and only during sleep do they "let go." Unfortunately, that release of inner anxieties often results in a wet bed. Not only is the child embarrassed at home, he may deny himself many of the joys of childhood - such as camping trips and sleep-overs with friends. Bed-wetting is a problem no child wants his friends to know about. The Bach Flower Essence, Cherry Plum, can free your child to share his worries and anxieties with you - and free both of you from the stress and embarrassment of bed wetting. Visit Feel Bach! today and help your child get on the path to happiness. Are you the dynamo in your group? Are you the one who serves on every committee... and then gets the work done while others fool around? Are you the one who provides cookies for every bake sale and tends your neighbor's dog while she goes on vacation? Are you just unable to say "NO" to any request? You may be in need of the Bach Flower Essence called Centaury. As much as you love your family and friends, you may be feeling tired, overworked, and even slightly resentful of the burdens placed upon you. The only way out is to begin saying "no" or "Sorry, not this time." But when you're in the negative Centaury state, those words just don't seem to come. Instead you put on a cheerful face and say "Sure, I can do that." Often, this "yes" state is caused by a fear of rejection, or a fear of taking charge of your own life. Centaury will help get your energies back in balance and allow you to be free of those fears. Try Centaury now, and enjoy summertime along with your friends and family. You really don't have to be the one to get all the work accomplished while others relax on the beach! Just get on over to FeelBach! to place your order - then get ready to start doing some of the things YOU want to do. Does your child fear the "Monsters in the closet?" Maybe they're under the bed instead, or maybe he or she wakes up screaming from a bad dream and can't calm down and go back to sleep. Plenty of parents have shared this experience and felt helpless to assure their children that all is well. Overcoming these fears may be as simple as turning off the TV - kids do absorb all that horrible stuff they see. Even some shows geared for children are full of violence and fear-inducing images. It might also help to stop talking about fearful subjects when the kids are listening.They can pick up on your conversations and translate them into imaginary terrors even more horrifying than the events taking place in the world. If you yourself are fearful, they will of course pick that up. Kids are "tuned in" far more than the average adult. Meanwhile, a bottle of Rock Rose on the bedside table could let you all get some restful sleep. This is the Bach Flower Essence of courage - the one that helps banish terror. Rock Rose is one of the ingredients in Feel5ive - the formula that lets you face stressful events with calm assurance. I use it if I have to go to the dentist (a horror from youth that won't go away) or if I have to drive or ride a long way on icy roads. It also helps when preparing to speak in public, go on a job interview, or any of a hundred other things that create a stressful anticipation. Sleeping pills are not a good idea for children - and could actually cause greater nightmares, along with other harmful side effects. So if your little one needs a dose of courage to chase away that closet monster, get a bottle of Rock Rose. Tonight I read a report that said a Stanford University study found that 95% of all illness was caused by stress. Not by germs floating in the air or some hereditary predisposition, but by stress. Thus, worry over the economy - even if you're secure in your own employment or other source of income - could be making you sick. Normally, I'd think that a generalized stress should be treated with Feel5ive, because it has helped me through so many difficult situations. But this ongoing climate of stress could trigger an intensification of other energy imbalances. These should be treated before they lead to illness. For instance, a person in the negative Aspen state already deals with uneasiness and fears that take no concrete shape. The uncertainty in today's economy could serve to intensify these fears. The negative Beech state, in which a person disapproves of and blames everything and everyone around him, has a tendency to cause digestive illness. Now, at a time when even formerly tolerant individuals are pointing fingers at everyone from politicians to corporate executives, this kind of illness could become common. To ward off stress-induced illness during these unsettling times, I think we should all either take the FeelBach! questionnaire, or study the qualities of each of the 38 Bach Flower Essences. Then we should take steps to keep ourselves healthy and stress-free. After all, we can't individually "fix" the economy - but we can individually care for ourselves and do all in our power to remain healthy. Last week we were talking about how the economy can make you sick - because according to a Stanford University study, 95% of all illness is caused by stress. Have you thought about how your stress affects your pets? When you're ill or upset what do they do? A friend told me this evening that when she's sick, one of her dogs hovers - stays right by her side and "fusses" over her. The other one hides. Both of these animals are reacting to her feelings, each in his or her own way. And both are feeling stress because the person they love is under the stress of illness. Pay attention to your pets. Are they behaving differently these days? It could be because they're picking up on your feelings about the economy - or about your illness or your worries about the illness of a loved one. Keep an eye on them, and if you see behavior changes, consider treating them with Bach Flower Essences before their stress causes a physical ailment as well. Feel Bach! has a questionnaire designed just for pets - and it will help you choose just the right combination of Bach flower essences to help them through this difficult time. In addition to the fact that you love your pets and want them to be healthy and happy, having them become ill is a stress you just don't need! Unless they work outdoors or have outdoor hobbies, most Americans simply don't get enough Vitamin D. Vitamin D is found in few food sources, and while milk is fortified, most adults don't drink enough of it to make a difference. That's why doctors recommend supplementing with Vitamin D - and why natural health enthusiasts recommend getting up and out of the house for a while each day. Sunlight is the only natural source of vitamin D that you'll get in any quantity. This is important for all of us, and especially important for older folks, as Vitamin D is important for maintaining bone health. Along with many other health benefits, it aids in fighting depression, and most surprising of all - cancer! While over-exposure to sun can lead to cancerous tumors, lack of exposure can also be dangerous. As with so many things in life, we need to strike a balance. Experts don't seem to be in agreement over how much sunlight is necessary, but all agree that using sunscreen every time you go out is harmful. You need to let those health-giving rays touch your skin. As it turns out, sunscreen doesn't always block the harmful UV rays, but does always block the beneficial rays. Some say at least 15 minutes per day - and turn your face to the sun. Others say face and hands are not enough - you need to expose a bit more skin. Exposure to sunlight and nature will also help your mental attitude - so get outside. If all you can manage is 15 minutes, take it, then look for more opportunities throughout the day. If you're reading this and thinking "No way, I don't have time," you may need the Bach Flower Essence, Oak. Oak essence is for those individuals who can't allow themselves the time to take care of their own needs - such as rest and rejuvenation. Instead they move forward with feelings of stress, pressure, and tension. This does no good for the individual - or for the family and friends who care for them. If that's you, get over to FeelBach! and get a bottle of Oak Flower Essence. Better yet, take the questionnaire - just in case other emotional upsets are adding to the problem. The experts at Feel Bach! will formulate a special blend, just for you, so that you can enjoy the wonders of the summer season. You deserve to enjoy summer without guilt or stress - so start taking care of yourself today. Stress seems to be the watchword of our times - triggered by everything from health issues to economic woes, to fear over the state of world politics. And while some react predictably by becoming irritable, snappish, and ultimately suffering from high blood pressure, others react with physical symptoms not immediately attributed to stress. Take, for instance, the gentleman who, after 2 years, didn't get over his bout with the flu. When the major symptoms of vomiting and diarrhea finally faded, he continued to experience headaches, fatigue, stomach cramps, nausea, bloating, gas, loss of appetite, serious weight loss and more. It didn't feel good to eat, so he quit - then eating irregularly caused more problems - the intestines just don't react well in that situation. So, the problem took on a life of its own. Because this worried him, he began going to doctors and undergoing one test after another, becoming more and more stressed over the thought that he could have a serious illness. Finally the doctors diagnosed Irritable Bowel Syndrome. They did recognize that stress was contributing greatly to this man's ever escalating medical distress, so prescribed anti-anxiety medication. But he won't take it because he fears the side effects of prescription drugs even more than he fears his present condition. I wish I could talk to this man. I'd suggest Bach Flower Essences, starting with the Feel5ive formula for stress. Had he been taking it two years ago when all this started, his original stomach virus would likely be a distant memory. Do the words "burned out" ring a bell with you? I used to feel irritated by them - because so often the people who told me they were "burned out" were those who appeared to be doing far less in their personal and professional lives that others who maintained their energy and production levels. Truthfully, I thought they were just using that as an excuse for laziness. Now that I know more about how our energies work, and how an imbalance can wreak havoc with even the most ambitious person, I have the compassion I should have had then. I also now know what to do about it! First, let me say that I know some people do need a change. They've done the same job or been overburdened with responsibility for so long that they need a physical break - a change of scenery and pace. But when those feelings bring on an energy imbalance, they can't even see the physical way out... they're stuck! The Bach Flower Essence Hornbeam can come to the rescue! Hornbeam removes negative feelings, lifts energy lefts and dissipates the lethargy that creates Monday Morning Blues. It helps bring enthusiasm and passion back so we can do our work well while we seek needed change. Sometimes other emotional blocks add to the problem. For instance, a person with too many responsibilities may be unable to sort out their thoughts and reach decisions about the future. Elm nurtures a sound mind and decision-making skills. Others have felt the "burn out" for so long that their performance has suffered - making them label themselves "loser." Gorse will combat that feeling and renew the self-confidence necessary to make positive changes. If you're suffering from burn out - or from any emotional imbalance that hampers your personal joy or professional success, visit FeelBach! and choose the Bach Flower Remedies that can restore your natural vitality. You can either read the descriptions and choose your own blend, or take the questionnaire and let the Feel Bach experts create the solution that's right for you. Do you love your friends and family so much that you could be harming them? If so, you need Red Chestnut. Red Chestnut is the Bach Flower Essence for those who worry unnecessarily about the health and well being of their loved ones. For instance, the Father who can't go to sleep at night until his children are safely home in bed, the Mother who walks the floor until her adult child, or anyone else she loves, calls to say they have safely made it to a destination, and the Grandmother who tries to discourage her grandchildren from participating in sports because she fears for their safety. Unfortunately the person needing red chestnut is not the only one who suffers. While the concern is based in love, the over-protectiveness and hovering can be stifling and even emotionally damaging to those they worry about. Dr. Bach even told about the reactions of his friends when he had suffered an accident - he said he felt their worry as an acute physical pain in his own body. Visit FeelBach! today and learn how Bach Flower Essences can help you release the fears that keep you from enjoying having people to love. Are you being faced with too many decisions today? Many are. And for many of us it's difficult. Even while we know that making no choice really is making a choice, we're unable to make a conscious, deliberate move. Remember back in school when girls used to be called "fickle" because they kept changing friends? They'd be "best friends" with one girl one week and another the next week. Then they'd do the same with boyfriends. When people talked about them they used the word "fickle" as a put-down and assumed that the girl in question was too self-centered to be loyal to anyone. But that probably wasn't the case. The poor kid probably just couldn't make up her mind. That's an emotional state that has more to do with lack of confidence than self-centeredness, but school kids don't look at underlying emotions. They only look at the outward actions. Right now the state of the economy is forcing people to make tougher choices. And the decisions we're making are far more serious than who to hang out with after school. In the financial area many need to choose which employment to seek or which new venture to follow to try to become self-employed. Those who would like to purchase a home need to decide if they should act right now or wait and see if prices and interest rates will fall even lower. People who wanted vacations have to decide if they should go forward, or cancel their plans because the economy is uncertain. Those involved in the stock market have to decide if they should buy, sell, or do nothing. Those are hard decisions for people who have trouble even deciding which movie to see on a Saturday night or which shoes to wear with the blue dress. If you find yourself paralyzed over making choices, let Bach Flower Remedies help you get over it. By rebalancing your energies, Bach flowers will help you release that paralysis and get moving. Scleranthus is the Bach Flower Essence that helps people make day-to-day choices, and Wild Oat provides decision-making skills related to career and the kind of life you want to live. You may have other issues that compound the problem, so read your FeelBach! brochure and identify the feelings that are holding you back. If you aren't quite sure what you need after reading the descriptions, fill out the questionnaire at FeelBach! and let the experts create a blend just for you. The most important thing in getting the blend that will rebuild your emotional health is to be completely honest about your feelings. If you don't have the FeelBach! brochure, go to the Feel Bach! website and read the on-site descriptions of the 38 flower essences and what they do. Are you one of the thousands of Americans who has suffered financially from the economic crisis? If so, you may be experiencing some emotions that can prevent you from going forward and making a new start. Feelings of helplessness often keep talented individuals from moving forward - as in seeking a new job after a layoff, or in trying a good idea that would lead to self-employment income. Wild Rose can help you regain your direction and purpose - and move forward positively even when faced with huge obstacles. Along with feelings of helplessness, bitterness, self-pity, and hatred are also common emotions for people who have been "downsized" through no fault of their own. It's understandable. Right now, no one can blame downsized employees of major corporations for feeling resentment when they pick up the newspaper and read that the directors of those corporations have been handed millions as bonuses while they're wondering how to make the house payment. After all, how many jobs might have been saved with a couple million dollars? But the fact is, resentment, bitterness, and all those other negative emotions won't solve the problem. The only way to move forward and regain a happy life is to put those emotions behind you and regain your positive outlook. Willow is the Bach Flower Remedy that will help you do just that. If you're having a hard time dealing with the crisis, and if negative emotions are weighing you down, consider Willow and Wild Rose. But do read the Feel Bach! brochure to see if you need some other Bach Flower Essences as well. For instance, if worry is causing you insomnia, you may need White Chestnut, and if you simply can't accept the changes that have occurred in your life, Walnut may be the answer. If you don't yet have your Bach Flower Essences brochure from Feel Bach!, you can read about the 38 different flower essences on the website - and while you're there you can order your own brochure. No, Bach Flower Essences aren't going to make your house worth more or cause the company you work for to stop laying off employees - but they just might lift your attitude enough to assure that YOU won't be one of the people out of a job. Depression, fear, worry, and sadness over the state of the economy seems to be the dominant feeling everywhere you look these days. You can't pick up a newspaper without seeing more bad news, and that seems to be what everyone is talking about, too. But, as in every economic crisis, some people will continue to thrive, both financially and emotionally. I think you'll agree that it's a good idea to be part of that group. We all gravitate toward people who make us feel better - and avoid those who make us feel worse. So not giving in to gloomy thoughts right now and instead keeping an up-beat, can-do attitude will go a long way toward making sure that opportunities come your way. Gorse is one of the flower essences that can help. According to the FeelBach! brochure, Gorse is for those who lose hope and faith. It insulates us from negative thoughts and gives us confidence to move on with hope and positive feelings. And, since it's difficult not to feel envious of the corporate executives who have been paid multi-million dollar bonuses while taking billions from the Federal coffers for their failing companies, Holly might be a good choice. It helps release hatred, envy, and resentment. Hornbeam and Mimulus also help rid us of negative feelings and fear, so could be appropriate today. Only you know just what feelings this economy is causing in you - so get out your FeelBach! brochure and decide just what help you need. If you don't have one yet, just go to FeelBach! and request it - there's no charge. Feeling the best you can feel in spite of the bad news around you is the best thing you can do to assure that you come through this crisis healthy, happy, and financially OK. If you do your own internet work, and if you're as technologically disadvantaged as I am, you know just how frustrating it can be. I spent about 3 days this week just trying to make things work properly. And by Friday afternoon I was ready to snarl at anyone who dared come near me. That did NOT feel good. And my frustration wasn't making the work go any easier. In fact, it was making it harder by the minute. I felt like I was never going to figure out what was wrong and how to fix it. Then, about the time my ill humor sent my husband hurrying out of the house to find peace and quiet in his shop, I remembered my bottle of Feel5ive. It took 2 doses about a half hour apart - and then I was calm again and was able to figure out what I needed to do. The silly part is - why didn't I think of that when I first started getting tense? It's not like I don't know how much good Feel5ive has done me in other stressful situations. I think the best idea is for me to bring a bottle to my desk - so it's there in plain sight to remind me to use it before I get so wound up that I don't even want to be around me. If you get as upset as I do over "techie stuff," remember to take your Bach flower remedies before it gets out of hand. In our last post I told you about one user's success with Larch. She also highly recommends Centaury, which she says is a blessing from the universe. Here's what she had to say: "I am not a martyr by any means, nor do I think lowly of myself, but I do have a big heart, & I found that people would take that for granted and I would give to my own detriment. I WOULD ALSO ACCEPT LESS THAN I DESERVED! Centaury has helped me to look out for ME and cherish me and only accept the best (Love, good treatment) for ME!" You can read her whole story at www.curezone.com/forums. The formal description of Centaury says it helps overcome feelings of inferiority and provides the courage to say no to unreasonable demands. But as this Bach flower user pointed out, sometimes this inability to say no stems from a true desire to help, even when you don't consciously feel inferior. After a few years of going along with such a program, most people would then need to seek a remedy to alleviate anger! Holly, perhaps? It just occurred to me that businesses and organizations would run far more smoothly if everyone had the courage to say no at appropriate times. Then people wouldn't take on far more than they could do well, might not turn in projects either half finished or poorly done, and wouldn't waste days in anger at those who expected too much. Once again, we invite your stories. We love hearing how Bach Flower Remedies are making lives better - just 4 tiny drops at a time. If you don't have your own copy of the Bach Flower descriptions brochure, do visit www.feelbach.com and order it. There's no cost - all you have to do is say you want it. While the descriptions on the FeelBach! site and in the free brochure give you an accurate outline of which flower essence is needed for specific emotional disturbances, sometimes it's helpful to hear exactly how they affect individual users. "Larch helped me with confidence in speaking, (sharing my ideas), feeling at peace in crowds, and has given me a sense of courage to try new things which I used to feel afraid to try from a "fear of failure". Larch has also helped me not to take other peoples comments personally & recognize that if a person says something unkind that it is THEIR PROBLEM not mine." Considering that so many problems in life begin with our own insecurities - those insecurities that allow us to emotionally crumble over another's unkind comment - it's good to know that something as simple as a few drops of Bach Flower Essences can allow us to go forward without being crippled by other people's opinions. The writer's further observation was that BACH remedies cure the issues at the Root. That is, of course, the reason why Bach Flower Essences can bring much greater relief than pharmaceuticals, which only strive to "cure" the symptoms. One last note: If you don't have your copy of the Bach Flower Essences brochure, simply visit www.feelbach.com and request a copy. There's no charge! This week one of the pet forums had a question about a dog who became constipated when upset. The dog's person wrote to ask for advice, because the dog was clearly miserable and the veterinarian had told her not to worry about it. The answers this woman got were all about diet - what to feed the dog to get her system back on track. All of them completely missed the part about what had caused the problem: anxiety. Of course I wrote and told her about Fee5ive and the other pet remedies for specific fears - thunderstorms (loud noise) and being left home alone. But what struck me about the whole discussion was that all of those people, while trying to help, were addressing ways to cure the symptoms - not to alleviate the cause. I think all of us who experience unusual and annoying physical symptoms should stop and think about the cause. It's true that too much of a new kind of physical exertion will cause a sore back, knee, or arm - but what if you've had no different physical exertion? Then it's time to ask if something emotional is bothering you. The same can be said for almost any physical ailment you experience. If you can't see a clear path from cause to effect, look to your emotional state for the cause. Finding the root of the problem requires complete honesty - but fortunately for all of us, we need only be honest with ourselves. Using either the descriptions of the 38 flower essences at FeelBach! or using the questionaire, we can get the right flower essences to rebalance our energies without having to admit our innermost feelings to another soul. Lately we hear more and more about kids, and even adults, with Attention Deficit Disorder - sometimes it seems almost like an epidemic. Some believe that it has a lot to do with diet - because fewer people are cooking from scratch, most people are eating a lot of preservatives and additives that we didn't get 40 years ago. But diet may not be the only culprit. Kids are subjected to so much external stimulation - from constant TV to video games to more and more pressures at school. Even pre-school has become competitive. When you combine that with parents who are stressed from working too many jobs or dealing with long commutes, it's no wonder that kids get a little off balance. Doctors answer parents' concerns with a prescription - and in my eyes that's very scary. Americans are already over-medicated and becoming ever sicker from pharmaceutical side-effects and adverse drug interactions. It can't be good to fill young, developing bodies with those toxins. Before you take the chance of using pharmaceutical drugs on your child (or yourself), why not try a cure from nature: Bach Flower Essences. The ADD problem is so common, that FeelBach! has even developed a "shelf product" specifically to realign the energies of children and adults who are suffering from it. Since Bach Flower Remedies are safe for everyone from infants to nursing mothers to the elderly, you'll take no chance of doing harm while you're trying to do good. Flower essences cause no adverse side effects - and if your child is already on pharmaceuticals, they can be used in conjunction without fear of drug interactions. Click here to order Feel Bach's Attention Deficit blend of flower essences.